Edgar wants a dog but instead he gets Jarvis. Jarvis is an octopus. A very smart octopus, but as hard as he tries, a determined Edgar cannot teach Jarvis to behave like a dog. 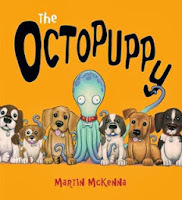 The Octopuppy is a sweet and quirky tale about accepting someone as they are, not turning them into your ideal, and about saying sorry. The relationship between Edgar and Jarvis is portrayed beautifully in the illustrations as is Edgar’s increasing frustration and Jarvis’s zany character. There is so much to discover in the detail of the illustrations. They are bright, imaginative and very entertaining. The storyline provides much to think about and discuss and the characters of Edgar and Jarvis are strong, endearing and very likeable. 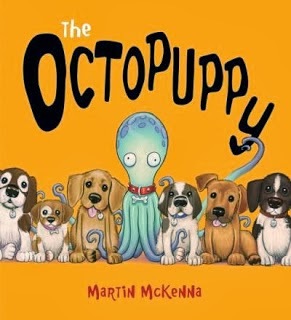 The Octopuppy is an entertaining story with a unique twist on familiar themes such as wanting a pet and disappointment. It is a story young children will love.